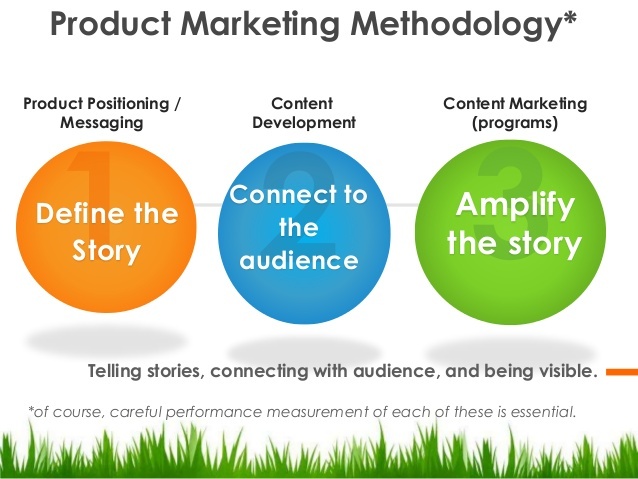 Being an effective storyteller in the business industry is a vital trait, whether you’re coming in from a marketer or business owner perspective. Why? Storytelling is an age-old art form; one of the earliest methods of communication known to mankind. As a result, we as humans have developed a “soft spot” of sorts when it comes to storytelling, which is why it’s such an effective tool for marketing purposes. For those of you mostly unfamiliar with Gary Vaynerchuk, he’s an entrepreneur whose business success has thrust him into the spotlight as not just a businessman, but an author, public speaker and internet personality. Vaynerchuk founded Vayner Media Group, a social media focused digital agency after used his knowledge as a wine critic to grow his family’s wine business form $3 million to $60 million. Vaynerchuck credits storytelling as the key tool for marketing success in the social media driven business scape, and in all of his public speeches, vlogs and marketing endeavors, his penchant for this talent is more than palpable. 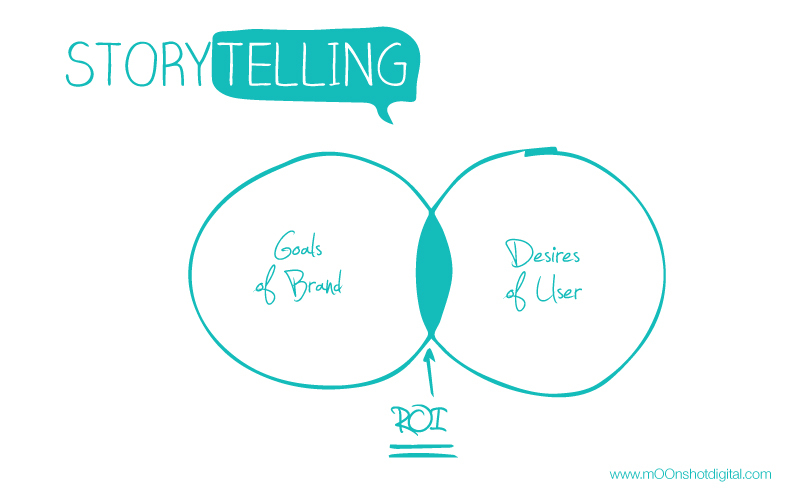 However, storytelling isn’t a one-size-fits-all kind of approach. As Vaynerchuk points out, you can’t be a business storytelling in 2018 like it’s 2007 and you can’t garishly repurpose content for every platform of your choosing under the misconception that you’re being effective. Context and content are key to effective storytelling – and fully understanding this ideal is what separates the players from the winners. The art of storytelling dates back to the beginning of communications. From cavernous drawings of wars and kings to medieval minstrels, to your most cherished childhood bedtime memories – storytelling is embedded in our culture; engraved in our hearts. As a result, there are numerous psychological implications to using storytelling as a marketing tactic. 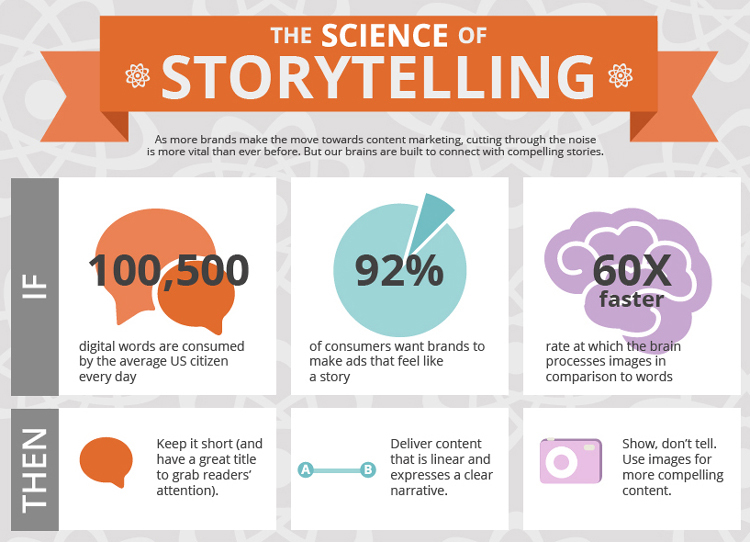 Kinesis Inc. has an awesome article on the science behind storytelling. Now, I’m a bit of a numbers and science nerd and I can easily get pretty obsessive with scientific and psychological theories. Emotion – Did you know your brain reacts completely differently to facts than stories? Almost twice as many neural centers are activated when your brain receives information in the form of a story versus data. Action – The aforementioned emotions that are evoked have a substantial impact on our behaviors. Neuroeconomist Paul Zak’s series of experiments connected storytelling to generosity by finding oxytocin levels directly impact an individual’s desire to give. Value – Stories literally have the ability to change our perceived values, according to a literary and anthropological study by the name of the Significant Objects Project. Memory – Storytelling has such a palpable connection with memory that there is literally a method of memorization known as “The Story Method”, which is used “in everything from Alzheimer patients to college students studying for tests”. Needless to say, storytelling has a pretty big impact on us historically, culturally and psychologically. We’ve been telling stories since the dawn of time – it’s just the methods and tools that have constantly evolved. In this ADHD generation, everyone’s short on time and marketers and business owners alike have to learn to tell stories in “micro moments”. Entrepreneurs have to learn to wear many hats and juggle competing priorities masterfully. This is especially true for small businesses, who have the added pressure of not just figuring out how to become their own marketing agency, but also how to apply these traditional concepts effectively in the digital landscape. In the world of digital marketing you’re trading in the stock of attention and your one, single goal is to evoke an emotion. “90% of digital execution is garbage” says Vaynerchuk. Don’t be that company. Traditional channels such as the newspaper, radio and television have been around forever as the set “tried and true” methods. However, with the inception of the internet came the once almighty king that was digital marketing, but with consumers spending roughly 10% of their day on smartphones, even digital marketers are realizing their 1% budget allotments for social media need some serious reconsidering. As a result, this trend towards social media marketing has effectively rendered traditional digital marketing techniques far less effective than they once were prior to social media’s glory days. In short – social media is (pardon my grammatical faux pas) — where the party’s at. Understand context. We live in an on-demand, “breaking news” society where everything is done on our time. Information is consumed in hyperspeed and average attention spans are dwindling to 8 seconds according to pretty much everyone and officially less than that of a goldfish. Video reigns king but images are still much more effective than any form of text. Remember the days when Google didn’t admit that Adwords click-through rate was down 15% in the last year? I mean seriously, the numbers are literally depressing. Vaynerchuk originally built his business with email marketing by developing and cultivating a 400,000 person email list. However, the entrepreneur and marketing guru woefully admits that “marketers ruin everything” and when it comes to email marketing, the mantra is no different. If you’re anything like the rest of us – your email inbox is chock full of so much marketing mail that you literally don’t have time or mental capacity to get it under control. Vaynerchuk offered hilarious allegorical insight during a 99U talk about how he views social media content as a proverbial “gateway drug” of sorts. “You give somebody a little nickle bag and then later you can sell them a ton of coke”, he joked to the laughing audience. 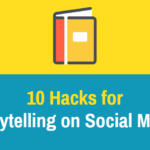 Vaynerchuk argues that it’s all about developing that original, authentic connection with a compelling story on social media in order to cultivate and engage your audience and then build upon your influence. Every social media platform has it’s own specific formats and types of content that are most widely used and make no mistake, they are not interchangeable. 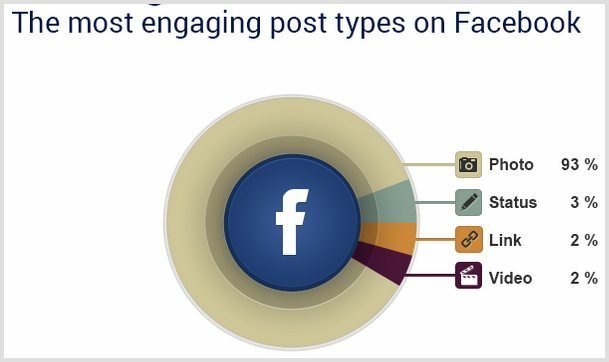 Content must fit the nuances of the platform it is being used on and a post on Pinterest is going to perform completely differently on Facebook or Instagram. On Tumblr, animated gifs are the content of preference where Instagram loves Instagram stories and images as a platform catered to creatives and women with a penchant the visual aesthetic. One way you can mitigate this discrepancy and stand out in a crowd no matter the platform? “Quality storytelling always wins — always” because the supply and demand of attention is just out of control. “Attention is the only asset that we need to be paying attention to”. 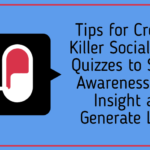 Resist the urge to simply use social networks as merely just a form of distribution in your marketing pipeline and use storytelling to foster organic connections with your audience. Vaynerchuk insists that by adopting this philosophy, entrepreneurs and business owners are able to overcome the fears of putting themselves out there in the open. He suggests you describe your journey, your vision, your thoughts, ideas, wins, losses, anxieties and ambitions and really strive for an emotional connection with your audience. Resist the urge to be a brand. Be human. We added this last fundamental because just like Vaynerchuk, we feel that experimentation is a vital component for success with your social media marketing endeavors. Experiment with stories, angles, perspectives, thoughts, topics and figure out which formula works best with effectively striking a chord with your audience. After all, it’s all about them in the end. So, there’s pretty much no denying that today’s world runs on a delicately balanced blend of social media and Starbucks coffee. If you’re going to be a successful business in this rapidly evolving, technologically advanced society, then you’re going to have to get hip with social media marketing. But it’s not just about the numbers, the ROI, the attention the followers and how it all impacts your bottom line. 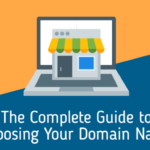 Unless you’re a digital marketer…or a business owner… then that’s literally all it’s about. But your audience isn’t you and they can smell a social media marketing pipeline a mile away. So the ONLY way you can guarantee success is by literally throwing the traditional notions of marketing out of the window. Seriously…find your nearest window and just chuck it. It’s about the organic connections. It’s about socially conscious brands. It’s about charity, empowering and uplifting the community with “quick brew” conversations in an ADHD nation. Stop wasting your time and money on posts and Facebook ad campaigns that don’t convert. Connect first. Then the influence, leads and conversions will come. What are your thoughts and opinions on this piece? Do you agree or disagree? We’d love to hear what you have to say!